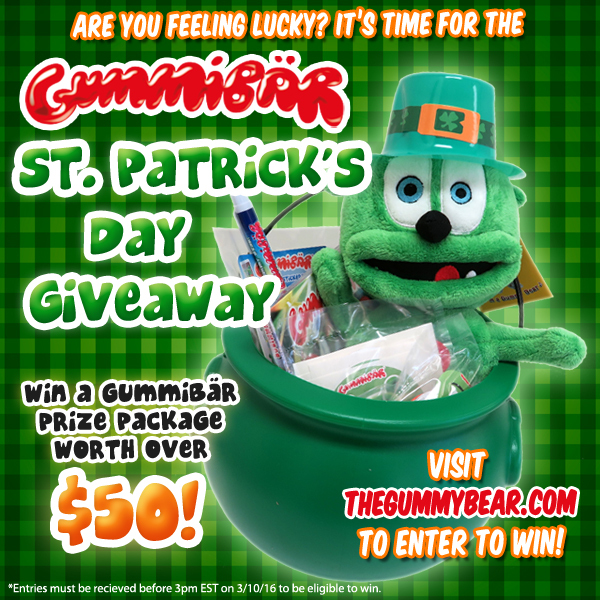 Gummybear International Announces Gummibär St. Patrick's Day Giveaway - Gummybear International Inc.
Gummybear International has announced the first-ever Gummibär St. Patrick’s Day Giveaway. One lucky random winner will receive a prize package filled with Gummibär merchandise and St. Patrick’s Day goodies worth over $50. This giveaway ends 3:00 pm EST on Monday, March 10th. One entry per person. All entries that meet the above requirements are eligible to win. One lucky random winner will be selected within 24 hours of the end of the giveaway and notified via email within 48 hours of their selection. If the winner doesn’t respond within three days time, a new winner will be selected.